There seems to be a lot of excitement about the emerging technology surrounding the Digital Displacement® pumps (DDP) and motors (DDPM) developed and patented in 1994 by Stephen Salter, co-founder of Artemis Intelligent Power. It is time to be rethinking the way we transfer energy through fluids, and I am delighted to learn about alternative approaches and new products that could make our industry stronger. Digital Displacement® has shown a substantial energy benefit using the technology to harvest energy from wind and waves by replacing mechanical gearboxes with hydraulic transmissions. When applied to an excavator, the technology demonstrated fuel savings of up to 20%, and maybe more importantly, an increase in productivity of nearly 30%. It is anticipated that the DDP will be able to reduce the need for a variable frequency drive (VFD) or a soft starter because the pump can be started with very little hydraulic load. For many, this digital technology may provide some real and welcomed cost savings, as well as improvements in productivity. 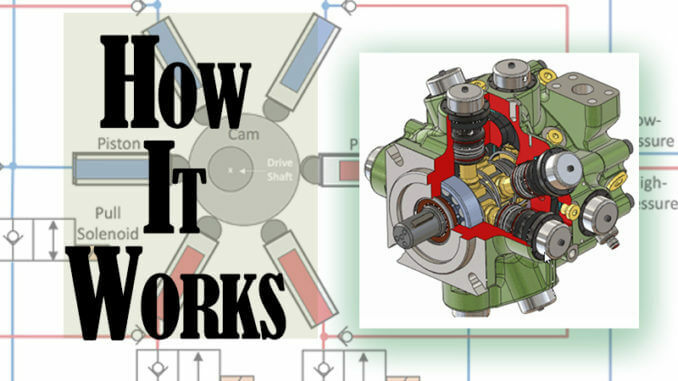 How it works: The logic behind the function of the Digital Displacement® pump is actually quite simple and straightforward. It is a series of fixed, positive displacement, reciprocating piston pumps that are arranged radially around a cam ring. The pumps can be individually turned on and off. Each piston pump has its own control system consisting of a solenoid operated poppet valve, a check valve and a piston position sensor. When configured so that the unit can be used as a pump or a motor (DDPM), each piston has two solenoids. These controls allow each pump to be put into or out of service in as little as 30 ms as the demand requires and can thereby limit the amount of fluid that enters the power stream. In effect, it is a multi-step transmission with each step capable of varying its output flow. The number, orientation, and size of the pistons can vary widely. Artemis Intelligent Power built a unit with 68 pistons that are used in capturing the energy from a wind turbine. A common configuration uses 12 pistons, arranged in 3 groups of 4 (Fig. 1). The simplified circuit diagrams showing a six-piston pump (Figs. 2, 3) show how this is accomplished. As the cam rotates, the pistons are alternately drawn in and pushed out. A check valve separates the high and low-pressure areas of the pump and a pull solenoid valve opens and closes the path from the low-pressure area. This makes it possible to treat each reciprocating pump as an individual source. 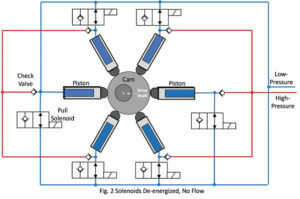 When no solenoid valves are energized, (Fig. 2) the low-pressure source would remain available to the piston during the complete revolution of the cam. The piston would simply cycle fluid out and back into the low-pressure core. It would effectively be taken out of the circuit and would require very little energy. In the event of electrical power failure, the DDP would fail to a no-flow, low-pressure condition. When a solenoid valve is energized, (Fig. 3) the piston would draw from the low-pressure core and then exhaust into the high-pressure core. As each piston is put in service by energizing its control solenoid, the potential flow is increased by 18 lpm (4.8 gpm). If part of a work cycle requires only 54 lpm (14.3 gpm), 3 of the solenoids can be strategically energized to produce the required output. Energizing the solenoids can also be timed in different ways so that only a portion of the piston displacement would be sent to the high-pressure core. To illustrate again using our 6-piston pump: if the flow demand is 63 lpm (16.6 gpm) the displacement of 3.5 pistons would be required. This could be accomplished by energizing 3 solenoids to put 3 pistons in service and 1 solenoid to close the path to the low-pressure side as the piston reached half stroke; half of the piston displacement would enter the pressure stream. Another approach would be to provide an average flow per minute by energizing all the solenoids for 1,044 revolutions and then leaving them de-energized for 756 revolutions. If these approaches cause unwanted power ripples, the same flow can be achieved by timing each of the 6 solenoids to cause the pistons to displace only 5.8 cc per cycle by “turning them on” at 58% stroke. So, there are not only 6 incremental flows available, but many discrete increments as well. 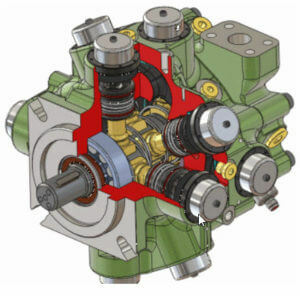 The DDP can closely mimic an infinitely variable displacement pump without having to maintain a constant core pressure. The individual pistons can be at inlet pressure regardless of the pressure at the outlet of the pump. 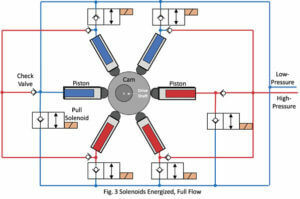 Another feature is that the output of each piston can be isolated to provide flow to several circuits; in our example, 6 separate functions could be fed from one single DDP, each with varying flow up to 18 lpm (4.8 gpm). While the logic of Digital Displacement® is straightforward, it is still a complicated piece of equipment. This does not necessarily mean that the DDP will be more costly to maintain. The individual moving parts do not have lower machining tolerances than conventional piston pumps and so do not require a greater fluid cleanliness level. The DDP and DDPM are designed to be computer controlled. Adjusting the timing of the solenoids based on signals from the piston position sensors and feedback from the work site is critical to gain the full advantage of the technology. This makes it clear that the use of the DDP will require a greater level of fluid power knowledge and experience than with pressure compensated or load sensing pumps. It would not be appropriate to make a price comparison between a conventional pressure compensated pump and a DDP. The comparison needs to include the entire system: prime mover, reservoir, heat exchanger, directional and electronic controls, and programming. It may well be that the savings in energy and the increase in productivity may outweigh any potential cost imbalance. It began well before 1994, but an event from that spring stands out as a turning point in my understanding of the need for energy awareness when designing or working on fluid power systems. I had been invited to assist in specifying a chiller for a hydraulic system. Someone in our industry had designed an inefficient hydraulic system. The unwitting customer had bought from the lowest bidder without asking or being informed about the cost of ownership. 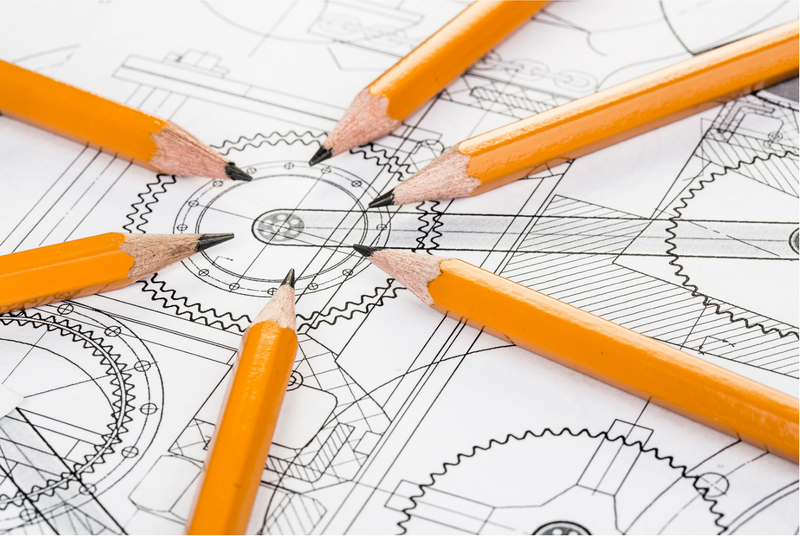 I determined that I was going to do my best to design systems that were as efficient as I could make them and to help customers and fellow fluid power professionals expect the same.